In java, it is possible to define a class within another class, such classes are known as nested classes. They enable you to logically group classes that are only used in one place, thus this increases the use of encapsulation, and create more readable and maintainable code. The scope of a nested class is bounded by the scope of its enclosing class. Thus in above example, class NestedClass does not exist independently of class OuterClass. A nested class has access to the members, including private members, of the class in which it is nested. However, reverse is not true i.e. the enclosing class does not have access to the members of the nested class. A nested class is also a member of its enclosing class. As a member of its enclosing class, a nested class can be declared private, public, protected, or package private(default). static nested class : Nested classes that are declared static are called static nested classes. 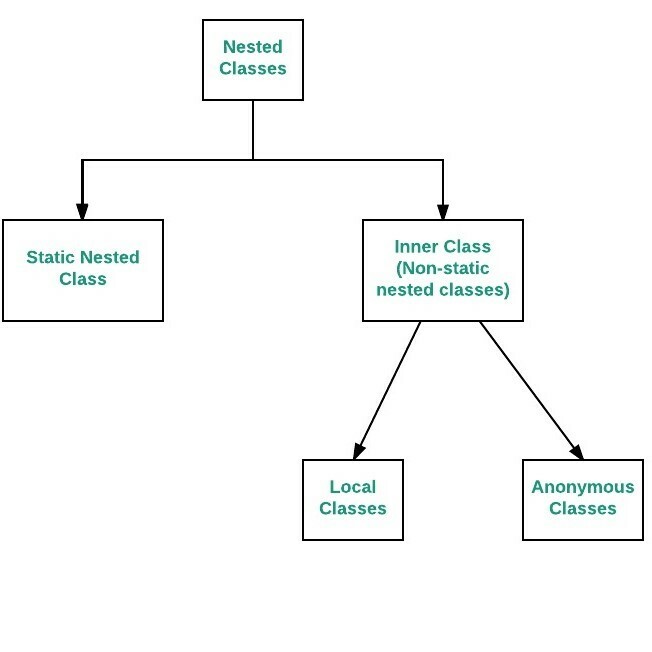 inner class : An inner class is a non-static nested class.